Ismael Mzai Changawa overcame a shaky start to beat Phenyo Matong of Botswana 6-4 6-0 to level the tie at 1-1. Kenya registered its first win of the Davis Cup Africa Group III today (Thursday) after a fruitless two days when they couldn’t even buy a stroke of luck. The morning however started with a scare when Captain George Oyoo opted to change his usual line up switching his usual number two Kevin Cheruiyot to see if he could change his team’s chances. Ibrahim Kibet Yego took Cheruiyot’s place and looked to tick Kenya’s win column when he faced Lefa Ashley Sibanda of Botswana on court two at the Antananarivo University grounds. 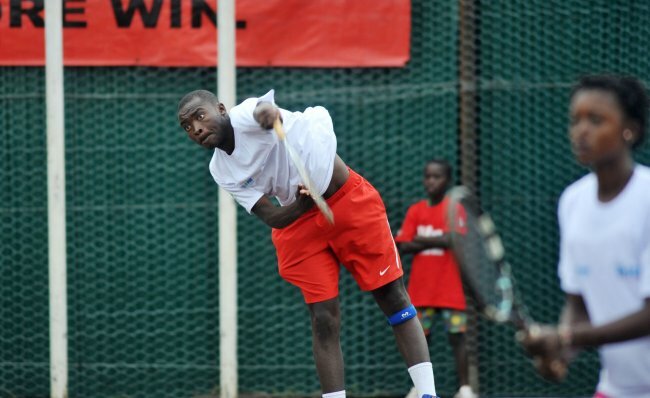 Nerves and the stage may have gotten to Yego when try as he might he couldn’t string two points together and eventually lost to Sibanda 4-6 3-6 to put the pressure on number one Ismael Mzai Changawa playing second. Despite a shaky start, Mzai steadied the ship and came through to beat Phenyo Matong 6-4 6-0 to level the tie at 1-1 leading into the doubles decider. Oyoo had expected a different result at this stage and had picked the youngster Olivier Kigotho to get a first taste of Davis Cup action but the score meant that Kigotho would be relegated to the cheering squad as Mzai and Yego looked to put a ‘W’ next to Kenya’s name. Despite the pressure however the two delivered and won in an easy 6-2 6-2 victory against the Botswana pair of Aobakwe Lekang and Bayani Moiliwa for a Kenyan 2-1 win at the third time of asking. Tomorrow sees Kenya play Algeria looking to cement a third position in the Pool and thus remain in the Africa Zone III, unless Botswana can pull a surprise on Madagascar to put Kenya in with a chance at promotion. This however is highly unlikely.